Become part of the circle sharing inspiration for spinning and other fibre crafting. It is a warm and reassuring place, sort of like a favourite chair near a cosy fireside, where beginners and experts come and go as they please. It's a place to share what we know, learn from each other and display what we've created -- while supporting and inspiring each other on the wonderful journey associated with handspinning and wool-related crafts. 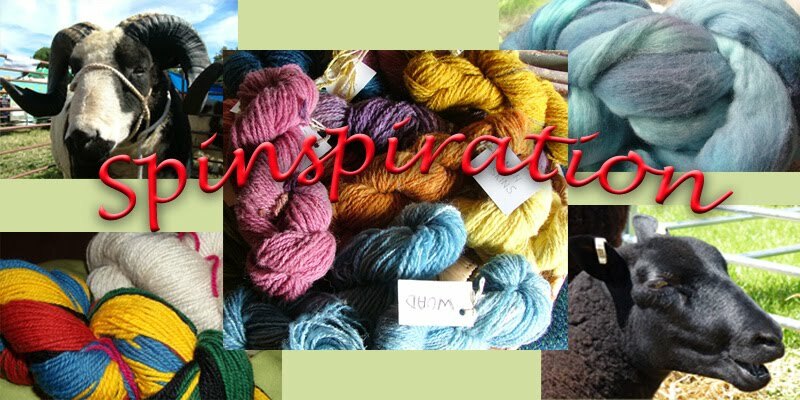 Welcome to Spinspirations Woolly Wednesday gathering for February, another month goes by - come and let us know what you have been doing with wool this month. All crafts and inspiration welcome. Woolly Wednesday falls on the first Wednesday of every month. Think of it as a creative gathering, or a virtual guild meeting. Bring along any fibre-related project, whatever it may be. If you are starting out in fibre arts, share what you are interested in pursuing. Let's show each other our projects, share any tips, tutorials, ask questions, seek advice. Add your post to the Linky below and we can visit one another and share, support, encourage, be inspired!. Please feel free to add the button to your blog's sidebar with a link to Spinspiration, a lovely way for us all to link together. Just copy the image to your desktop and then in your blog design - add a gadget, add picture - upload the picture and then add the url (http://spinwheelspin.blogspot.com/) and the image will link to here. Join us with the linky below, link to a recent blog post of your woolly adventures in the last month or to a post in the month ahead, we look forward to seeing you, no time limits just join us when you can. If anyone has anything they would like to read about here, do let us know and we'll see if we can help with advice, links or suggestions. Similarly if anyone has anything they would like to share, maybe we could have guest posts sometime. Our little online gathering is a place to share.